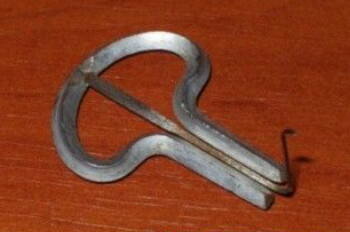 Drymba (дримба; Jew's harp). A plucked folk musical instrument that was popular among the common people in Ukraine. It consists of a small horseshoe-shaped metal piece and a slender metallic strip (tongue) extending between the two arms. The drymba is held between the teeth while the end of the metallic tongue is twanged with the forefinger. The instrument is used mostly by shepherds.